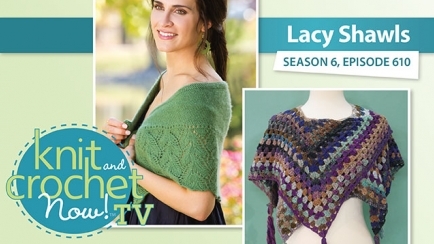 Jenny King demonstrates her beautiful crochet Blue Lagoon Shawl, perfect for many occasions. 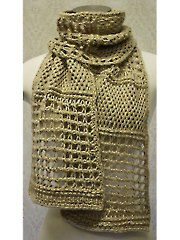 Caryl Pierre’s knit Rhea Capelet is next with Kristin. Lena demonstrates how to make a Tunisian Scarf. 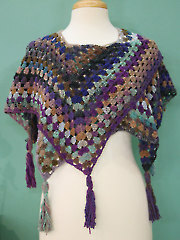 Planning on making the Blu Lagoon scarf. It looks perfect for cool Florida evenings and restaurants. I also noticed the designer's vest. I really like that, too. Is there a pattern for it? I made the Blue Lagoon scarf, and absolutely love it! I get compliments whenever I wear it, and I wear it often, because it's perfect for car rides, cold restaurant temps, and autumn walks. I used Liberty Wool, because it has long color repeats, and because I am a larger size, I made 25 rounds instead of the 19 called for, and it's a perfect length. Thanks for the great pattern! I love your show and all of the cool things you teach me.